This crate provides fast functions for printing integer primitives to an io::Write or a fmt::Write. 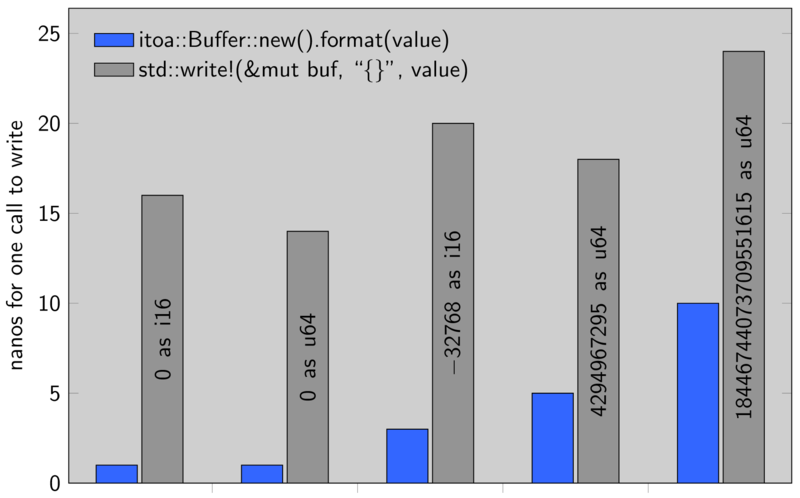 The implementation comes straight from libcore but avoids the performance penalty of going through fmt::Formatter. See also dtoa for printing floating point primitives. where itoa::Integer is implemented for i8, u8, i16, u16, i32, u32, i64, u64, i128, u128, isize and usize. 128-bit integer support is only available with the nightly compiler when the i128 feature is enabled for this crate. The return value gives the number of bytes written. The write function is only available when the std feature is enabled (default is enabled). Unless you explicitly state otherwise, any contribution intentionally submitted for inclusion in itoa by you, as defined in the Apache-2.0 license, shall be dual licensed as above, without any additional terms or conditions.